-An awesome and useful autocomplete. 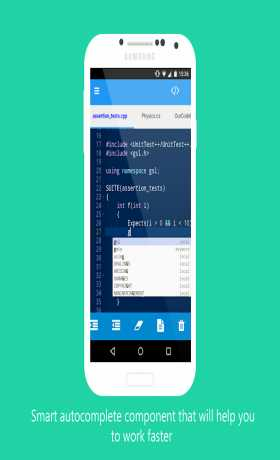 -Syntax highlighting for over 124 languages. -Choose a editor theme (over 34 available themes). -Support for Emmet (Increase your HTML workflow). -Analyze the difference between 2 files or its last save state creating a diff file. -Edit, download and save files directly from your Dropbox, Mediafire Account (More sources upcoming). -Go to an specific line using “Go to line”. 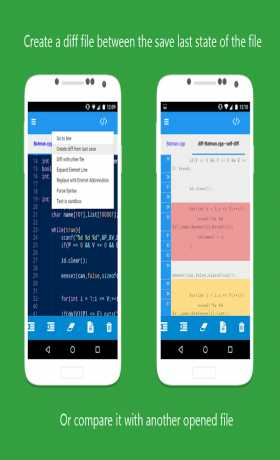 -Shows or hides line numbering (Gutter). -Preview html u other files in the Sandbox. 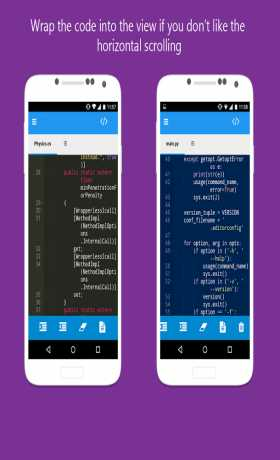 Enjoy an awesome coding experience using Our Code Editor with Hacker Keyboard (A developer keyboard for android).